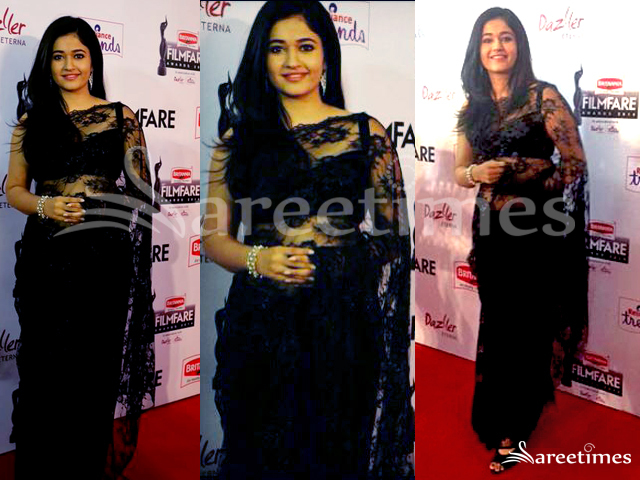 Poonam Bajwa at the South Filmfare Awards event in a black lace net saree paired with a sleeveless black blouse. 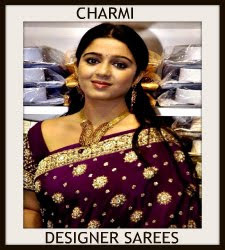 Bollywood actress Kushboo Kamal in designer net saree embroidered lace border and mirror work all over it.Paired with short sleeves saree blouse with open neck pattern and glossy work on it. Bollywood and South Indian actress Vidya Balan in pink designer saree with lace border and gold printed leaf work on fall.Paired with pink open back saree blouse. 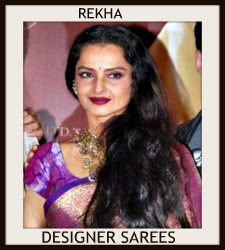 South Indian actress Geeth Shah in light pink and navy blue colors chiffon designer saree, silver and white embroidery heavy floral work unique border, White small mirrors embellished on the pallu area in blue color. Light pink chiffon pleats and silver lace border comes at the top, Paired with contrast blue sleeve less heavy work blouse in velvet fabric, square neck patterned and white zircon stones, kundans enhanced nice embroidery work comes across the blouse. 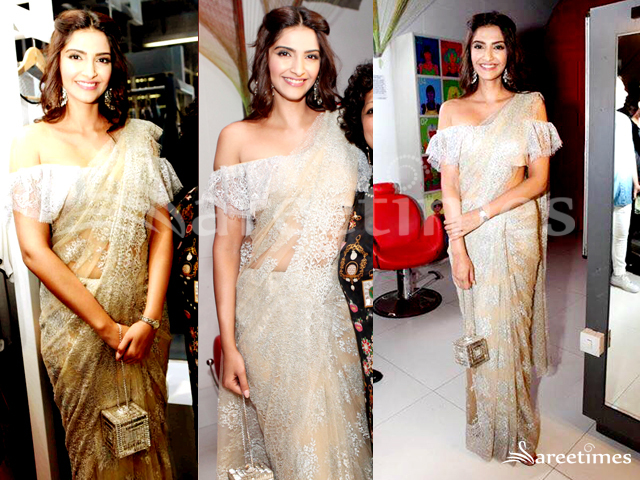 Bollywood actress Sonam Kapoor in white designer lace saree with self embellished work all over.Paired with full sleeves blouse with embroidered work designer by Anamika Khanna at Cannes 2013. South Indian actress Sonam Kapoor in designer dual color saree.Paired with balck full sleeves blouse witth round neck pattern at Cannes 2013. 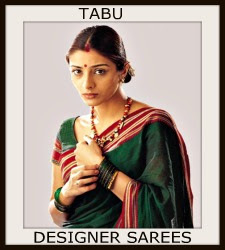 Bollywood and South Indian actress Mugdha Godse in beautiful green and black designer half and half saree. 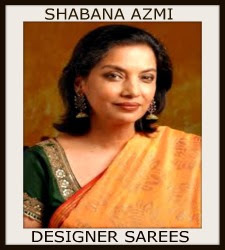 Designed by Masaba Gupta at Mirchi Marathi Awards 2013. 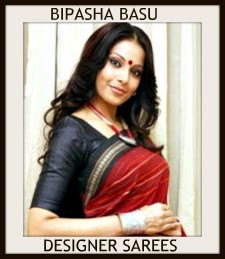 Red printed design work all over black saree and gold lace border. 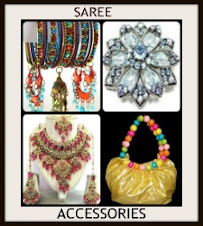 It is paired with black designer embroidered sleeveless saree blouse. Embroidered sequins buttes on it. 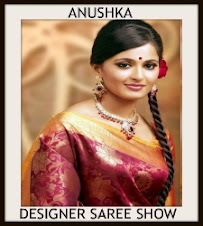 Model displaying pink designer plain saree with pink and silver lace border work paired with designer sleeveless saree blouse from designer Shruti Sancheti. 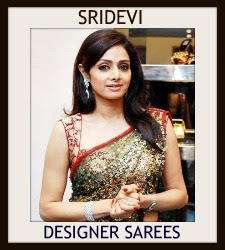 Bollywood and South Indian actress Sridevi in beautiful magenta designer georgette saree with printed and lace border work paired with designer short sleeves saree blouse from the movie ‘English Vinglish’. South Indian actress Aashika in blue designer shimmer saree with gold designer lace border paired with designer saree blouse. 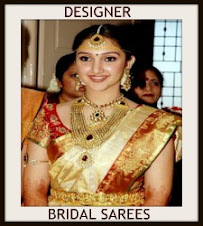 Bollywood and South Indian actress Konkana Sen in beautiful white designer saree with gold lace border paired with designer embroidered short sleeves saree blouse with round neck pattern. Bollywood actress Priyanka Chopra in beautiful gold designer shimmer faux saree with lace border work paired with designer embroidered sleeveless saree blouse. 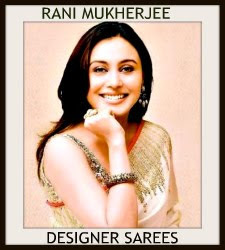 Bollywood actress in beautiful pink designer plain saree with silver lace border work paired with designer rhinestone strap saree blouse. 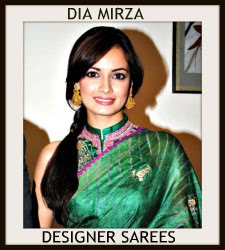 Bollywood actress in beautiful snaf designer saree with embroidered lace border work paired with designer sleeveless saree blouse for back. Model walks in maroon and gold designer tricolor shimmer saree with gold lace border work paired with designer full sleeves saree blouse from designer Kavita Bhartia at Day 4 Wills Lifestyle India Fashion Week Autumn/Winter 2012. Model walks in beautiful silver designer shimmer faux georgette saree with lace border work from designer Dev R Nil day 3 Wills Lifestyle India Fashion Week Autumn/Winter 2012. 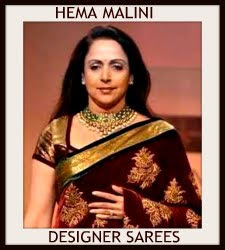 .Model displaying beautiful cream designer shimmer faux georgette saree with printed and lace border work paired with designer sleeveless saree blouse with ‘V’ shape neck pattern from designer Manish Malhotra at day 3 Wills Lifestyle India Fashion Week Autumn/Winter 2012.